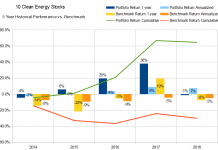 With a president actively hostile towards renewable energy and focused on promoting fossil fuels, it would be easy to think that clean energy stocks would underperform their fossil cousins. The exact opposite has been true. Despite the administrations’ efforts and tweets bragging about new highs for the Dow, energy funds are down over 10% for the year. For example, the Energy Select Sector SPDR (XLE), largely composed of oil and gas companies, is down 13% for the year. The tiny coal sector did better, with the VanEck Vectors Coal ETF up 18%. Even so, Trump’s favorite industry was behind the one he seems to hate the most, clean energy. 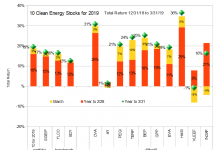 The broadly held Clean Energy ETF (PBW) which I use as a benchmark for my growth stock picks is up 24% year to date, which my clean energy income stock benchmark (the Yieldco ETF YLCO) is up 20%. Perhaps this administrations’ ineffectiveness is simply the result of the chaos resulting from the many investigations into the possible corrupt practices that may have helped bring this administration into power. Or perhaps the media spotlight has helped the solar and wind industries bring the message to a broad audience that solar, wind and energy efficiency are the most cost effective energy resources. The President can remove environmental regulations and allow coal companies to increase their profits from existing plants and the expense of citizens’ health, but he can’t make new coal plants more economic than solar and wind, no matter how many regulations he removes. Wind and solar have simply come too far for a mature technology like coal to catch up. In short, the President may brag about the stock market, be his efforts have little to do with its actual performance. 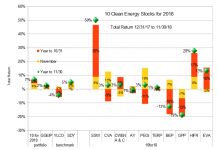 While clean energy has been doing well, and my Ten Clean Energy Stocks model portfolio has been doing better. For the year to July 31st, the portfolio is up 24.7% compared to 20.8% for its benchmark. The success has been driven by the core eight income stocks (up 24.8% vs 19.6% for YLCO.) My real managed Green Global Equity Income Portfolio (GGEIP) is up 19.9%, slightly ahead of the same benchmark. My two growth picks are up 22.2%, closing in on their benchmark PBW at 23.8%. See the chart below for detailed performance over the two months since the May 31st update. 12/31/16 Price: $18.99. Annual Dividend: $1.63 (8.6%). Expected 2017 dividend: $1.64 to $1.67. Low Target: $18. High Target: $30. Wind-focused Yieldco Pattern Energy Group made a strong 13% gain in June and July without any significant news. This move is mostly in line with other Yieldcos, most of which made gains for the two months. The Yieldco ETF (YLCO) was up 7%. I believe this trend is mostly due to the market realizing that the Trump administration can do little to undermine Yieldco profitability, combined with a return to more normal valuations in the wake of the 2015 Yieldco bust. Pattern’s somewhat stronger move compared to other Yieldcos is most likely a function of better valuation. 12/31/16 Price: $12.98. Annual Dividend: $1.00 (7.7%). Expected 2017 dividend: $1.00 to $1.05. Low Target: $10. High Target: $20. 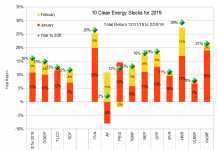 8point3 Energy Partners gained 10% for the two months, also ahead of the average Yieldco. This is most likely due to its relatively high dividend yield. I believe that 8point3 is somewhat overvalued at the current price. Both its parent companies, First Solar (FSLR) and SunPower (SPWR) have said that they want to sell their stakes, and an examination of the Yieldco’s financials leads me to believe that they are unlikely to find a buyer for more than $13 a share. If they can’t find a buyer, I believe that 8point3 will be forced to drastically cut its dividend in the next one to three years, a move which will almost certainly send the share price tumbling. I have sold my position in CAFD and sold short calls on the stock. Hannon Armstrong Sustainable Infrastructure (NYSE:HASI). 12/31/16 Price: $18.99. Annual Dividend: $1.32 (7.0%). Expected 2017 dividend: $1.34 to $1.36. Low Target: $15. High Target: $30. Sustainable infrastructure and clean energy financier Hannon Armstrong continued to advance over the last two months. 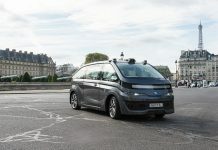 On August 3rd, it announced solid second quarter results slightly ahead of analysts’ forecasts, and continued its slow advance. Its 34 cents of core earnings for the quarter topped its current dividend of 33 cents. This is significant because HASI has a target of paying out 100% of core earnings as dividends over the course of a year. Given the core earnings growth trend, I expect the company to raise its quarterly dividend to at least 35 cents per share in December. Previously, my low end estimate was 34 cents. My high end estimate remains at 37 cents per share. 12/31/16 Price: $15.36. Annual Dividend: $1.00 (6.5%). Expected 2017 dividend: $1.00 to $1.10. Low Target: $12. High Target: $25. In July, Yieldco NRG Yield’s (NYLD and NYLD/A) parent, NRG Energy (NRG), announced that it was looking for a buyer for its stake. NRG Yield’s stock rose on the news, but at the current price of $18, I don’t expect that there is much room for a buyer to pay a premium. Using a similar methodology as I used for 8point3, I estimate that a buyer should be willing to pay between $15 and $21 per share for 8point3, based on my estimate of sustainable CAFD per share of approximately $1.50 to $1.70. 12/31/16 Price: $19.35. Annual Dividend: $0.65 (3.4%). Expected 2017 dividend: $0.65 to $1.45. Low Target: $10. High Target: $30. I like Atlanica’s cautious approach with its dividend, which allows the company to retain cash and make small acquisitions like a 4 MW mini-hydro plant in Peru on July 20th, despite the company’s current depressed stock price. I was hopeful, however, that Atlantica would have obtained the necessary waivers by this point, and increased the dividend much further. 12/31/16 Price: $25.54. Annual Dividend: $1.36 (5.3%). Expected 2017 dividend: $1.38 to $1.50. Low Target: $20. High Target: $40. NextEra Energy Partners continues to be the star of the Yieldco space, and has now reached a point where it should be able to fund acquisitions with secondary offerings of stock. As long as investors are willing to buy more shares at its current yield of below 4%, NEP should be able to maintain its target annual per share dividend growth of 12% to 15%. I personally prefer Yieldcos with higher current yields and lower growth prospects, and so have been taking profits on my position. I am happy to see NEP’s share price recovery, and not just because of the capital gains. The long term dividend growth NextEra Energy Partners hopes to deliver will require the purchase of ever larger numbers of clean energy projects, or even entire Yieldcos. This renewed appetite for clean energy projects will lower the capital costs for future wind and solar farms, increasing the number that will be built. 12/31/16 Price: $15.60. Annual Dividend: $1.00 (6.4%). Expected 2017 dividend: $1.00 to $1.06. Low Target: $10. High Target: $30. Waste-to-energy developer and operator Covanta reported strong second quarter results on July 27th. The company reported a strong waste disposal market. Covanta President and CEO called it a “good time to be a waste company” on the conference call. Revenue per ton increased 3.3% year over year. The company also expects increases in the prices it will get for recycled metals because of a new sorting facility. The one sour note was continued weakness in energy markets. With the completion of company’s new Dublin Facility to be financed entirely with non-recourse debt, Covanta expects to begin to pay down debt towards the end of the year. The market liked what it heard, reversing a 9% decline in June with a 14% increase in July. 12/31/16 Price: $19.94. Annual Dividend: $2.05 (10.3%). Expected 2017 dividend: $2.05. Low Target: $18. High Target: $27. Leading independent charter owner of container ships Seaspan reported second quarter results on August first. The market for container ship leases continues to improve, as does Seaspan’s balance sheet. The company paid down $147 million in net debt over the quarter, in part ($34 million) financed by the issuance of new common shares. For holders of the preferred stock, this is unadulterated good news, since we suffer no dilution from the new common stock (which is junior to preferred) but still gain from the stronger balance sheet. 12/31/16 Price: $6.19. Annual Dividend: $0.14 (2.3%). Expected 2017 dividend: $0.14 to $0.16. Low Target: $4. High Target: $15. Shareholders should buckle their seat-belts and continue to enjoy the ride. 12/31/16 Price: $4.13. Annual Dividend and expected 2017 dividend: None. Low Target: $3. High Target: $10. In recent updates, I’ve predicted that aerogel insulation manufacturer Aspen’s stock would underperform, although I maintained a positive long term outlook. In fact, it has been in a slow rising trend, even if it was a little slower than clean energy stocks in general. On August 3rd, Aspen reported second quarter results, and the market reacted positively to the improving (if still weak) business fundamentals. For me, it looks like Aspen will likely be “the one that got away,” but I will continue to monitor the stock for readers who did not sell at the bottom, as I did. I’ve added to my positions in Seaspan Preferred and Covanta in the last two months. I have reduced my effective position in NRG Yield (and taken some profits) by selling covered calls. I’ve increased my short position in 8point3 by selling uncovered calls. Although the economics of clean energy are strong, recent stock market highs, the likely slow increase in interest rates, and political uncertainty make the stock market a risky place to be right now. While I am skeptical about the sustainability of 8point3’s dividend, my short calls on the stock also serve the function of partially hedging my investments in other Yieldcos. Despite (or because of) the recent gains in the market and clean energy stocks, now seems a good time to invest cautiously. Previous articleHow Much Could Another Yieldco Pay For 8point3? Next articleCan Investors Recover Faith In Energy Recovery?